KATHMANDU, March 21: Nepali manufacturers have become upbeat with the response that they have received from importers in the United States for Nepali readymade garments. They have become hopeful about the revival of Nepal’s readymade garment industry following assurance from US importers that they would always give priority to Nepali garment products. The US is one of the prime markets for readymade garments manufactured in Nepal. 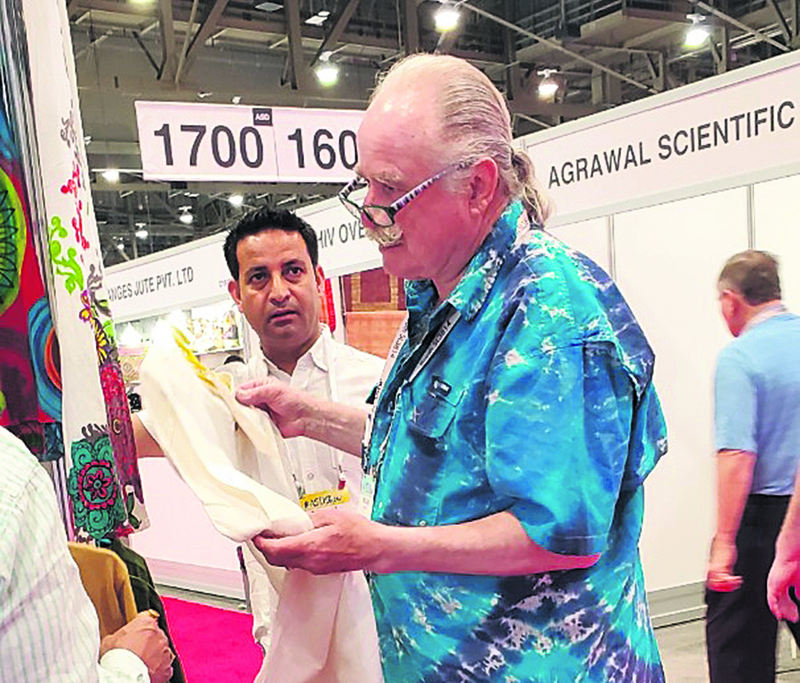 Chandi Prasad Aryal, the president of Garment Association Nepal (GAN), said that members were upbeat with the positive response that they have received from importers who visited Nepali stalls set up at a trade fair in Las Vegas in the United States. “American buyers were positive toward Nepali garment. This has given us confidence that this product could once again become the country’s top exports,” Aryal told Republica over phone. Six garment manufacturers are participating in the trade fair that started that concluded on Wednesday. They had set up three stalls in the fair. Basant Adhikari, managing director of Himalayan Cotton and Fashion International Pvt Ltd, who also participated in the fair, echoed Aryal. Adhikari also said that they have got encouraging reaction from American buyers. “The world-renowned retail chain Walmart also seems to be very positive about Nepali readymade garments,” said Adhikari. 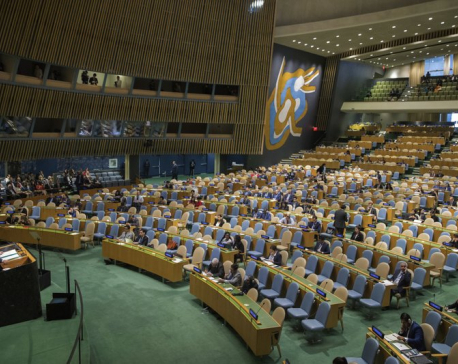 “However, we have been left behind in the international market due to our own reasons. 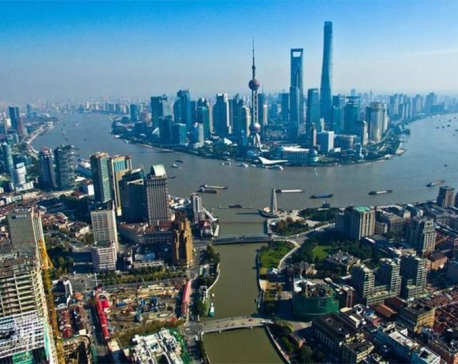 Our cost of production is very high compared to other countries,” he added. According to Aryal, there is no alternative to lowering the cost of production to become competitive in the international market. “Most of the American buyers who visited our stall shared a similar suggestion: lower the cost and we will buy as much as you produce,” he added. Adhikari, who is also an executive member of the GAN, said the government should facilitate for revival of the country’s garment industry. He added that factors like higher wages and rent, costly bank loans and delay in acquiring concessional loans were affecting Nepali garment industry. “The government has revive this sector by coming up with a relief package,” added Adhikari. He said that the garment sector also does not have better marketing strategy. While commending the role of the Trade and Export Promotion Center (TEPC), he also said that the government should work toward facilitating Nepali garment industries to participate in international trade fairs for promotion of their products. Sharad B Rana, the TEPC executive director, admits that the government has not been able to work adequately to revive the garment industry. “Though the TEPC has felt the need to produce skilled manpower required for the garment industry, it has not been able to organize vocational training due to lack of budget,” Rana told Republica over phone. He said that the confidence of Nepali industrialists has grown due to positive response and ‘satisfactory’ order that they have received from importers during the fair. 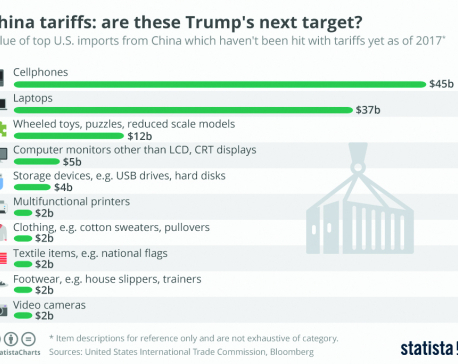 Infographics: China tariffs-are these Trump's next target?